Really appreciate the multiscreen! That must have been a really long render. Thanks! Awesome, thanks! Could you also do a night multiscreen using the same night scene you did for the dragons, but without the dragons? "I second that THANK YOU!!" We appreciate the server cycles for this one! I started the multiscreen rendering this morning. I agree, a multiscreen of this version would be great. I too would love to see multiscreen renders of this piece. I would really enjoy multis of many of the Pickle Jar images, but just having the main gallery version would be enough! Thanks again, Ryan, for your outstanding work! Any chance on getting a multi-screen of this? I like Chris' idea for a night version of this one, with perhaps bioluminescence providing much of the lighting, and possibly moon rays slanting in through the top of the cave. It would be terrific! A popular render, Ryan! 8.80 is a strong rating; with just five more votes this would be -- well, in the top 25 at least. Multiscreen? It's too bad the 2560x1080 resolution is only available after the multiscreen is rendered -- my hubby is patiently waiting. Love this! When you released Dragons Gold I hoped you would make another wallpaper with a similar feel. This is amazing and needs to be multiscreen! I second the petition for a multiscreen of this one. Think you could do a multiscreen of this as well? Love this one. This just keeps getting better. The dragon's wing thanks you! I'm glad you separated Cave of Arches from Festival of Dragons. Now that we can enjoy both renders without having to choose one, I find that I like Festival of Dragons more than I did before. And this one is still a solid 10. Thank you, Ryan! Feels like the mushrooms in the foreground - the ones in direct sunlight - reflect too much light. Plus I agree w/ Chris, night version would be cool. Maybe with moon rays, and a hint of "Fluorescence" on the ground. So much life. Me gusta. Lookin' good!!! Love the new version of this. Once again, the lossless 1440p file is not downloading. I really wish you would confirm that each resolution was uploaded correctly initially. Thanks. also, would LOVE to see this one at night! Love the added color, the depth of the image, the lighting ... so good. ... of course, that should be "least", not "lease". Very nice. Projects a sense of serenity and peace. Techno-glitch: at lease for me, now via two totally different ISPs, only about the top 5% of the 4096x2560 will load -- just freezes after that, no-go on reloading. All other versions I've tried come in just fine. This is the reason I'm a member. 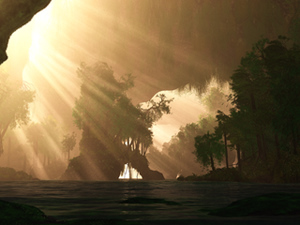 Awesome lighting, interesting landscape, beautiful water, lush flora. Great work! Ah, lovely! That's a wrap. I like this a lot as a piece on its own. I like this version better than the first. The trees in the foreground provide a nice contrast to the rest of the picture. It's makes me want to stare at it and take pleasure in looking at all the beautiful diversity in it. I think it is one of your best nature scenes. With that said I still like the pickle jar version the best. It looks like the second variation is missing from the Pickle Jar even though it shows two should be there from the main screen. I like the water in the original vs the new one. "Liked the Original Unfinished Version Better"
The lighting in the original version cast some light on the trees on the right, which was a beautiful effect. Now, the trees are all in shadow. 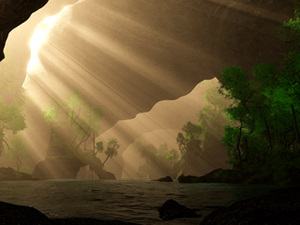 Trees would not grow where no light falls, so the original version gave just a hint of possibility that trees could grow and thrive in the caves. Now, it doesn't seem possible. I love all the improvements, particularly the flowering vines and the added trees in the background and on the left. I *think* the reason the original is more popular with some folks is that light rays lit some of the trees on the right in the original version but not in the latest render, making it harder to see the details. The cave ceiling is vastly improved from the original. In version two, I was going to suggest some roots or stalactites to go with the moss or whatever because it seemed as though something was missing. However, I like version three as it is, with just a hint of the green foliage at the edges. Terrific render, Ryan! I think this represents a good compromise between the first two renders. I give it a solid 9. The lossless 16 x 9 aspect is not a complete file. Only the top half of the image loads. I prefer the pickle jar version myself. I do like that added vegetation in the newer version, however the vibrancy of the color in the original cannot be beat. The water and rocks in the original are also better I feel, more realistic looking. I think the lighting in the second version is too subdued and prefer the original in this respect as well. So I have to say the pickle jar version far outweighs the second version. The island in the middle looks a little like a lion with one paw up. I think this is a great picture. I wish I was swimming in the water with a hot babe. The only criticism I have would be a little less glare from the sun so I can see the vegetation better. That's why I like the pickle jar version better, but it's still great to look at, and it is the new screen image on my laptop. PJ var. (7/10): I like the rocks (close up ones) and the water. They look more realistic. Current ver. (8/10): I like the over arching cave, vegetation, and trees. The trees are a much better green, deep and lush, not the almost neon on the PJ var. If possible I would overlay the lower part, water line and down of the PJ var. on to the current. That's a compliment, btw. Just realized it could have sounded like me doggin' your work. Saying that the SOFTWARE is the weak part of the team, not your skill! Wish you could get the graininess out of so many of your shots. It's a pity the software isn't up to snuff to compete with your skill. The little island in the middle looks like the spines of the dragon. Was that intentional? 1) I think the brighter green leaves provided a more striking contrast than the subdued green. In the new render it feels like only a two-way contrast between the streaming light and the brown/green cave/plants compared to the three-way contrast in the first. 2) I liked the archway better off-center. 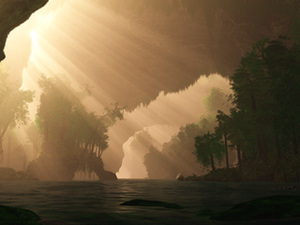 Especially combined with the higher intensity of light in the background, the new render gives the impression of looking out of the cave, whereas the first gave the impression of looking down a passageway into a much deeper cave complex. Textures could use a bit of touch up. Otherwise very nice piece. I'm really glad you're not doing another variation of an old render again; I got kinda tired of those. I really like it, though for me the lighting would need to be toned down a bit in order to use it on my desktop. So glad you managed to open the file again! I can't wait to see the final version. Thanks! Love the concept. Obviously it's a bit grainy (since it's unfinished, totally get it) but this is the sort of place I wish I could see myself in a kayak. "Journey to the Center of the Earth" was always one of my favorite scifi classics and I think I could see this in that book somewhere ... anyway, I would love to see you finish it! Is there an iPad HD version? A specific observation: I love the way you've done the water through roughly the center third of the frame. It looks very natural, nearly photo-like. By contrast, the immediately adjacent shore line and beach are an order of magnitude behind. Not bad, but nowhere nearly as well executed as the water presently is. I'm guessing that the foreground is one of the places you're still working on. The closest I come to digital art like you do is my clumsy attempts to "enhance" pics with Photoshop (like letting a 12 year-old drive a Porsche) -- in other words, I'm no expert. With that windup, I note that the boundaries between "zones" in the images seem to be the most difficult to make look right (natural, or whatever). They often (certainly not just in your work) look so sharp and crisp that they end up sticking out like the proverbial "sore thumb." The "shore" in this image, as well as the horizon in Starfall are prime examples of this. Admitting that I'm a hamfist WITHOUT your talent, I respectfully recommend working on this aspect. All this said, there's a reason I have a life membership at DB. Keep up the good work Ryan! You must have missed the part where I originally put this one in the Pickle Jar under "Dragon's Gold" but was asked to feature it on its own in my Main Gallery. It's nice, but it's very, very similar to "Dragon's Gold". Another great one in the making! Even your half finished works are still awesome. So jealous. Unfinished though it may be, this is really one of my favorites. Evokes "Of All Places" on a grander scale. To adapt a quote from Harry Truman, "The only alien places are the Earth you don't know yet." I am reuploading the 2560x1600 PNG now. I have no idea what's going on with the timestamp though. Weird! The "2560 x 1600 Lossless (16:10)" version isn't loading all the way. Thank you, Ryan, for giving "Cave of Arches" a room of its own! Thanks for all the feedback! 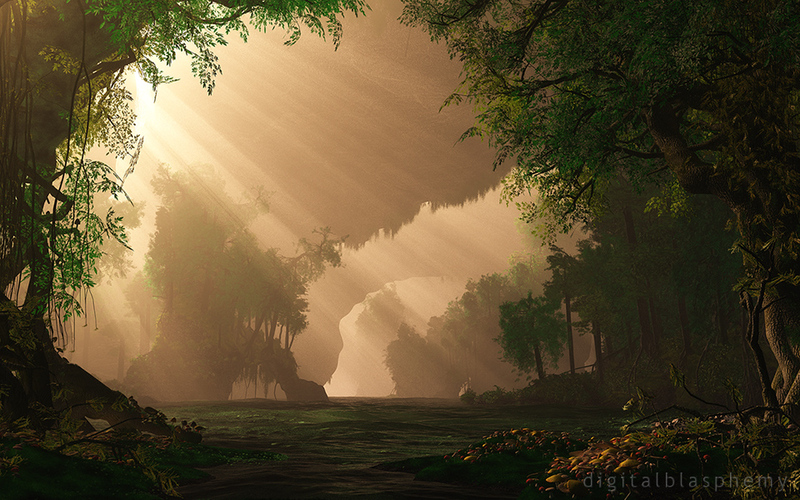 "Cave of Arches" now has a permanent spot in my 2013 gallery (even though I created it in late 2012). I will try to recreate it someday!! I love this. It's an epic scale but being closed in it still feels like a secret place. It has a real sense of presence, of atmosphere, of being someplace special. Arches is absolutely beautiful, my breath is really taken away by this image! "I Don't Know What To Call It"
But this is my "type" of picture. Huge in scope, both in concept and perception. Some of the space stuff doesn't look big to me, go figure. Maybe the word is: vistas. Plus it's just a little unreal. Would trees really grow here like that? I think that's good too. 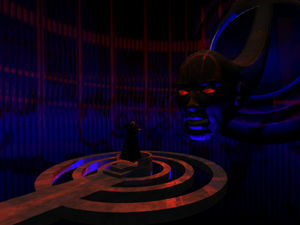 Sci-fi fantasy, alien worlds. Please do what you have to with this one and I encourage more like this in the future in the future. Wow, Arches Caves is a terrific render! Even in its current less polished form it's remarkable, and the overall composition with the sun rays, trees, and arches evokes a feeling of tranquility. I know it would be a pain to recreate this but IMHO it would be worth it. Too, I agree with Justin that it deserves its own placement. It really doesn't go with Dragon's Gold and won't get the visibility it deserves here. I really dig this piece, even if it isn't 100% polished. It's good enough as it is to take its place as my current wallpaper. Even if you can't go back to it as-is, I wouldn't relegate it to the Pickle Jar. Afraid it might not get as much exposure there, and I think it deserves to be seen. "Please don't let this one fall to the side"
ArchesCaves is stunning and I hope you have the desire to go back to it. I know how hard it is to recreate something like this after a loss but this one is definitely worth it!